Just as the 975XBT recumbent bike and the 500XLS upright bike, the Exerpeutic 2000XLS is part of the “GOLD” series released in 2017. Despite the fact that it is an affordable elliptical trainer, it features an automatic magnetic resistance system and a console with 21 workout programs. It also has Bluetooth connectivity and it’s compatible with MyFitQuest4 app. Although it’s a rear-drive elliptical trainer, it’s far from being a large fitness machine. It has a rather small footprint compared with other ellipticals, such as the NordicTrack SE9i, for example. With the frame completely assembled, its footprint is only 53″L x 25″W (135 x 63.5 cm). This being said, it can be a great choice for a cardio machine if you don’t have too much usage and/or storage space. However, it is recommended to leave at least two feet of clearance on each side, and at least one foot of clearance at the front and rear, for safe operation and easy access. Also, the unit’s highest point is given by its mobile handlebars. It reaches approx. 63″ (160 cm) above floor level. 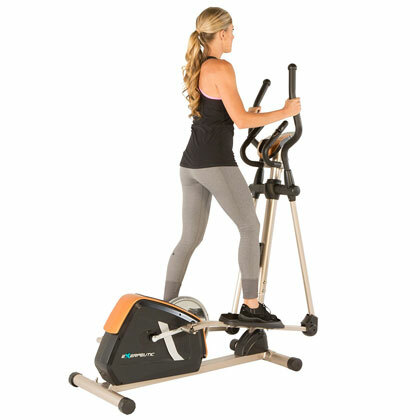 Speaking of its handlebars, this Exerpeutic elliptical trainer is equipped with two sets, one mobile and one fixed. The mobile handlebars feature a multi-grip design; they also have ball grips at the top. Their handgrip sections are covered by a fairly thick layer of rubber foam material in order to improve hand adherence and comfort. The fixed handlebars have the same type of grips. They also integrate metallic pulse sensors, so by holding on to them, the console unit can monitor your heart rate. Needless to say, most of the unit’s frame is made of steel tubing. However, there also are several durable ABS parts in its construction. Among them, we can count the pedals, the joint cover, and the covers of the drive system. All the steel parts feature an abrasion-resistant and rust-resistant powder finish. The color used is metallic gray. The Exerpeutic GOLD 2000XLST elliptical trainer is not an extremely heavy fitness machine but does weigh over 81 lbs (~37 kg). This weight provides enough stability to prevent it from wobbling or moving when you exercise. Its rear base is equipped with polygonal stabilizers which allow you to perfectly level the unit on any type of flooring. The unit’s frame doesn’t fold. However, transporting the fully assembled unit to storage shouldn’t be too difficult as its front base integrates two wheels. 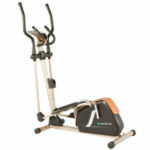 The Exerpeutic GOLD 2000XLST elliptical machine is equipped with a set of large ABS pedals and a heavy-duty crankset. It’s rated for a user weight capacity of 275 lbs (125 kg). The pedals are large enough to accommodate athletic footwear of all sizes. They have a non-slip surface and an all-around border to provide extra foot stability. They are non-adjustable, though, and they do not integrate any additional cushioning. 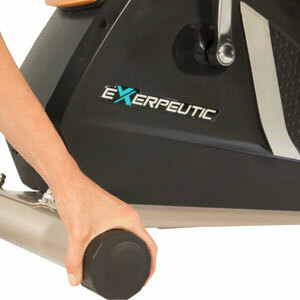 However, just as for most elliptical trainers, the stress on the joint during workouts is almost inexistent. The trainer’s elliptical path is slightly inclined forward, so the pedaling feel may be similar to going down a soft ramp. The unit’s stride is approx. 13″ (33 cm) and is non-adjustable. This means that the unit can accommodate comfortably users between 5’1″ and 6’2″ (155 – 188 cm). Taller users should also be able to use the machine, but they may consider the stride a bit short. 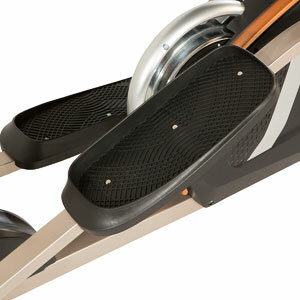 The pedal step-up height is approx. 9″ (24 cm). However, the highest point of each pedal reaches approx. 16″ (40 cm) above floor level. Therefore, it’s recommended to use the machine in a room with a ceiling that is at least 20″ (51 cm) higher than your own height. This Exerpeutic elliptical trainer is equipped with a fairly large, balanced flywheel, designed to provide a smooth momentum. 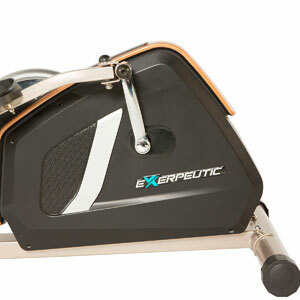 As opposed to other similar ellipticals, such as the Efitment E006, the flywheel of the Exerpeutic model is not completely concealed by the side shrouds of the drive system. Its top part is visible on the outside and features a top guard for extra safety. The flywheel is bi-directional. It gives you the possibility to pedal in reverse. This way you can considerably diversify your workout spectrum. Also, if pedaling in reverse, the console will continue to monitor your distance traveled, calories burned, etc. Last but not least, this trainer features a belt drive system, powered by a poly-v belt. Just as any belt drive, it comes with three main advantages. One, it doesn’t require lubrication. Two, it generates considerably less vibration than a chain drive. Three, it’s almost silent. 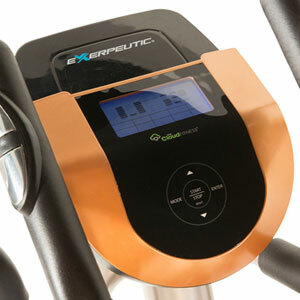 As we’ve mentioned above, the Exerpeutic GOLD 2000XLST features an eddy current resistance system. This means it has to be connected to a power source in order to make available the resistance settings (the power adapter is included). Its resistance can only be adjusted from the console. Also, in case you chose to exercise by the means of one of the preset workouts, the machine will auto-adjust its resistance. The resistance system consists of a small motor and a magnetic brake. As you select a certain resistance level from the console, the motor will adjust the position of the magnetic brake in relation to the flywheel. This will change the intensity of the magnetic field leading to more or less pedal tension. The unit’s magnetic tension control makes available 16 distinct levels. The first level delivers very little resistance, basically provided only by the weight of the flywheel. These being said, the first 1-3 levels of resistance are great for light workouts or recovery training. However, the 16th level of resistance simulates a steep climb, offering the possibility to perform a considerably more intense workout. The Exerpeutic 2000XLST is equipped with a mid-range console featuring a 5″ LCD display with blue LED backlight which considerably improves its readability. Its display is divided into several sub-sections and therefore you can view most of the workout metrics at once. It shows time, distance, total distance, speed, RPM, calories, watts, and pulse. Although it has Bluetooth connectivity, the console cannot track your pulse via a Polar HR chest strap transmitter or any other type of HR chest strap. It can only monitor your pulse if you hold on to the sensors integrated into the fixed handlebar. The Bluetooth connection allows your unit to connect to the MyCloudFitness base in order to track your workout progress. It’s also compatible with the MyFitQuest4 app available for iOS and Android. The unit has 21 preset programs. Each program has a specific focus. For example, some focus on fat burning, others on an intense cardio activity, and others give you the possibility to perform an interval workout. There is a heart rate program which will automatically adjust the unit’s resistance in order to keep you in the selected cardio interval. There’s also the “Manual” mode which gives you the possibility to adjust the resistance as you pedal whenever you want. There are two user profile settings available. For each profile, the user can save their own favorite settings and monitor their progress. Also, the unit offers goal settings for time, distance, and calories. In other words, it allows you to set up values for these workout metrics, and it will countdown from the selected value until it reaches zero. Last but not least, the top part of the console is equipped with a tablet holder which is large enough to accommodate any tablet. The tablet holder is conveniently placed above the console display and a tablet placed on it won’t cover your workout data. But on the other hand, the console doesn’t have a USB port or any docking port for a tablet or smartphone. This elliptical trainer comes pre-assembled. Its base with the resistance and drive elements is already in one piece. Therefore, all you need to do is attach the base bars, the pedals, the console mast, the moving and fixed arms, and the console. This shouldn’t take more than an hour. Basic tools for the assembly are included, while the manual provides excellent instructions for it. For maintenance, it is recommended to periodically check the integrity of the machine, look for loose or broken parts in order to re-tighten or replace them before using it. Also, the joints may require lubrication after a while. No docking port for a tablet. The Exerpeutic GOLD 2000XLST is an elliptical trainer designed for home use, equipped with an eddy current resistance system. It offers 16 levels of resistance and has a balanced, bi-directional flywheel. It can hold users up to 275 lbs. It features a Bluetooth enabled console with 21 programs, compatible with the MyFitQuest4 app. It’s an excellent machine for light to medium intensity cardio training, recovery training, intervals, stamina development, and weight loss. It’s also an affordable machine, offering an outstanding value for the price. You can see the manual HERE. The programs are shown there too, but not all the information for them is provided. Each program has 10 segments which indicate the level of resistance. Not sure about the default timer of each segment, and whether it can be adjusted or not.